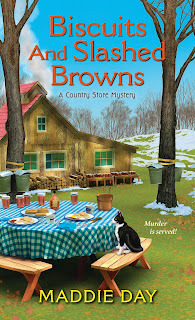 Detective Oscar Thompson reports in from Maddie Day's Country Store Mysteries, plus a Biscuits and Slashed Browns ARC giveaway to one commenter. State Police Detective Thompson, here. Ms. Day asked if I would report on the recent homicide case in South Lick, Indiana. As our public liaison officer is regrettably out of town, I shall comply. A town resident, Ms. Adele Jordan, called in the discovery of a body behind the wood pile of a maple sugar shack. Assisted by the local authorities, my team and I commenced our investigation. Unfortunately, Ms. Robbie Jordan, proprietor of a local restaurant, seemed to want to become involved in solving the crime. What is it with these amateur sleuths, anyway? I'll admit, she revealed a certain ability to ferret out certain facts in the case, which evolved to be a difficult one to resolve. Luckily for all involved, the criminal was apprehended without additional loss of life. The author wishes me to inform you that she will convey an advance copy of her new book to one individual who comments here today. Please state your views on the average citizen acting as an unlicensed private investigator. Macavity- and Agatha-nominated Edith Maxwell writes the Quaker Midwife Mysteries, the Local Foods Mysteries, and award-winning short crime fiction. As Maddie Day she creates the Country Store Mysteries and the Cozy Capers Book Group Mysteries. Maxwell is President of Sisters in Crime New England. She lives north of Boston with her beau and two cats, and blogs here, with the other Wicked Cozy Authors, and with the Midnight Ink Writers. You can find her on Facebook, twitter, Pinterest, and at her web site, edithmaxwell.com. Well, Detective Thompson, sometimes the average citizen does know a bit more about the local scene and characteristics of the people involved. A lot of average people are very observant too. There are times when those not directly involved see things. If they have information that could possibly help, what does it hurt to listen? Where would we mystery readers be without "the average citizen acting as an unlicensed private investigator"? From personal experience, there are times when one must "assist" in an investigation. It's best to work with the authorities or at least let them know what you are doing if possible and most assuredly stay out of the way so as not to hamper an investigations. However, there are times that people will talk or let slip something when the authorities are not around that can be very helpful if that information is turned over to those in authority to help with the investigation. I look forward to reading this latest book, in such a fun series. I don’t think you could have the cozy genre without average citizens taking action. In books, I think it's great and gives us so much opportunity for wonderful stories to escape to. In real life, I can't imagine trying to solve a crime on my own but I suppose if I was put in the situation I would be out there sleuthing to my best abilities! I think we all are unlicensed private investigators to a certain degree. I think the average person should leave the sleuthing to the professionals. It's makes for good reading, but I think it could be dangerous in real life situations. I enjoy reading about amateur sleuths, but I have never met a real-life one (other than nosy neighbors). Since I live in a pretty small town, I think someone that is an ordinary citizen could be a great detective. Living in a small town and knowing everyone, it's more likely you will be told things or hear things that the regular police would never know about. I definitely don't think it's safe for ordinary citizens to "investigate" crimes with taking on serious risk. However, I also think that people should be honest and forthcoming with information they have. I love this series and would be honored to win a copy!! In real life it's not safe to investigate a crime but in the world of cozies the amateur would be able to draw people out easier than the police. I think an average citizen can see things from a different perspective than some dectives. Also other citizens might be more willing to share certain facts to a peer than to a dective. Yes, there could be some risk but in South Lick one would hope not much. Sounds very dangerous to me. Carol, congratulations! Random.org selected you to receive the advance copy of Biscuits and Slashed Browns. Please check your email. I think an average citizen investigator could be very helpful he may get information others have missed and they are in on around the town gossip. Thank you for the chance. Lamonicaks (at) gmail (dot) com. Congratulations to Carol Schmoker! Random.org selected her to receive the advance copy of Biscuits and Slashed Browns. I wish I had a copy for everyone! Thanks to you all for your interest and your comments.